Cheondoism History - What is the history of the Cheondoist (Chondogyo) religion? Donghak (which means "Eastern learning") was an academic movement based on Neo-Confucianism that was founded in by Choe Je-u in 1860 South Korea. The movement was based on the ideas in his book, Dongkyeong Daejon ("Comprehensive Book of Eastern Learning"). The Donghak movement began as a reaction to the encroachment of Western ideas (Seohak - "Western learning") and military forces into the reading. In particular, Choe was especially alarmed by the arrival of Christianity into Korea, and the Anglo-French occupation of Beijing. Choe was opposed to Korea's ruling Joseon Dynasty, and believed that the way to counter Western intrusion, was to establish democracy and human rights in the country. In 1892, peasant supporters of the movement began an insurgency which involving raiding government offices, as well as killing landlords and foreigners. Choe Je-u was captured and executed by the government. He was succeeded by Choe Si-Hyeong, but he too was captured and executed in 1898. The third leader of the Donghak movement, Song Byong-Hi, after a period of exile in Japan, established the Chinbohoe ("progressive society"), a reformist movement aimed at social improvement through the renovation of traditional customs and ways of life. Under Son Byong-Hi, the third patriach, the movement eventually became the religion of Cheondoism ("religion of the Heavenly Way"). Son Byong-Hi modernized the religion in an attempt to gain legitimacy in the eyes of the Japanese (who were gaining increasing influence over Korea) during this period. Eventually, even Emperor Gojong of Korea's ruling Joseon Dynasty, embraced Cheondoism, and began to promote the religion. Gojong added Buddhist rituals to the new religion, and helped organize the religion's organizational hierachy. Korea was annexed by Japan in 1910 and was to remain under Japanese occupation until the Japanese surrender at the end of World War II in 1945. After the Japanese surrender, the Northern part of Korea was occupied by the USSR, and the Southern part by the United States. Revival governments were set up in each part of the country, and these eventually became North Korea and South Korea. Cheondoists found themselves on both sides of the divide. However, many Cheondoists, fearing Communist rule, fled to the South. Today, North Korea, while nominally a multi-party state, is a Communist dictatorship. The country is strictly controlled by the Worker's Party of Korea, and has a government that does not tolerate independent religious activity. Official figures from North Korea say that there are 2.8 million Cheondoists (12.9% of the population) in the country, but this is impossible to verify. 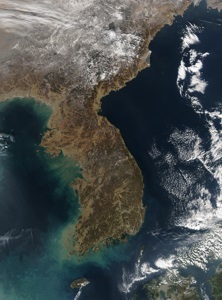 South Korea is home about 1.1 million Cheondoists, including more than 280 Cheondoist Churches.